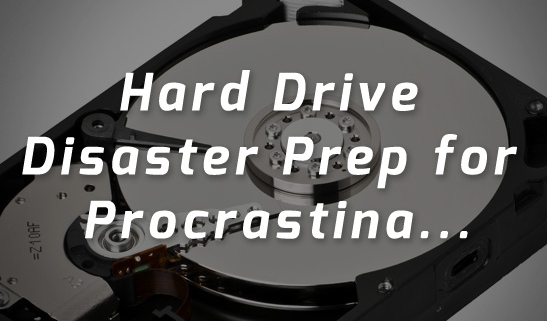 For many small businesses, the only activity that regularly occurs around data backup is procrastination. The bad news is that two major computer catastrophes are always on the horizon, waiting to destroy any valuable files stored on your office hard drives. While you may have used privacy issues, cost or complexity as excuses to avoid finding a way to backup your files in the past, today’s secure solutions are making data backup and recovery much easier. Relying on your computer or local servers alone for storage can lead to serious data loss. Here are a few ways to backup your data easy enough that you might actually do it. An OS failure is somewhat easy to fix with a reinstallation of the operating system and programs. However, this will cause you to lose all of your personal data that was stored on your hard drive. Unless you have a backup of those files, they are written over during the reinstallation. You probably know that crashes are the result of serious damage to a computer that affects the hard disk, but you may not realize that a crash can happen no matter how carefully your computer is handled. All hard drives will eventually fail. Their parts simply wear out over time. Whether your hard disk is worn out or your OS has failed, you need to have a backup plan. External drives and NAS devices work on the same principle—you backup your files to a different drive, and recover your data from them if needed. External drives carry some of the same risks as your hard disk. The external drive is also vulnerable to wear and will eventually fail. The disk only contains the information from your last scheduled backup. The NAS device saves to more than one disk to minimize risk of failure, and data is saved in real time. External drives and NAS devices are both at risk if your place of business suffers major damage. Cloud storage provides real time backup with offsite security at a data center. Specialized data storage providers can offer you cloud solutions tailored to small or medium businesses. You can take advantage of scalability, low cost and privacy settings so that only you have access to your data. Most importantly for backup procrastinators, cloud solutions don’t rely on you for a scheduled backup. Your files will automatically be updated. If your company’s data is at risk, it’s never too soon to stop procrastinating and find a storage solution. Contact Data Deposit Box for more information about cloud storage for small and medium businesses at 1.866.430.2406.